At present, early in the season, it’s hot and sultry. I feel lazy. I don’t want to do anything except lie in my hammock, dozing off with an unchallenging book. Returning from a long overseas winter holiday has done nothing to improve my discipline. It’s been so very hard to kickstart my practice after two months of travelling. Yet I have done it now. Getting back into the routine of writing weekly blog posts has been harder. I’ve been sitting at my computer and immediately think of chores: watering, laundry, grocery shopping. Email needs answering and phone calls returned. I certainly don’t want to be sitting at my computer trying to find something fresh and interesting to say. But here I am, writing away, because that’s what I do. Eventually I find my disciplined writing muscles. I feel I need to be the one carrying the flag for discipline when others have gone off to lie in their own hammocks. That wise yogini, Judith Lasater, has said that the most important part of yoga practice is consistency. Veteran yoga practitioners, and writers as well, appreciate the power of routine. I get up each morning and, more often than not, I meditate with my husband. When we started doing this, our commitment wavered. Then we became more regular, simply because meditating is a good thing to do. Just as old meditators report, life goes better with meditation. Now, I’m back in my routine. In the a.m., pretty much without missing a beat, I go off to the Yoga Shed to do my practice. The disciplined yogi back doing practice an hour and a half, six days a week. Okay, in the interest of full disclosure, on a particularly sparkling summer’s morning, I might opt for walking on the beach instead. I’ll be thinking, I’ll get to my practice in the cool of the evening. Do I? Well, sometimes that southerly doesn’t come through, and then neither do I.
Here’s the point, though. After a while, weeks or months or years, we’re better off dispensing with all the options. It’s more freeing to stick to the program. This is where the expression ‘discipline is freedom’ comes from. 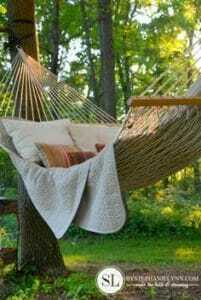 And, if you happen to get the work done, there might just be enough time left for the hammock.